Growers' third Super Bowl spot stays determinedly apolitical. Apparently, the Illuminati have meetings as unproductive as everyone else’s. 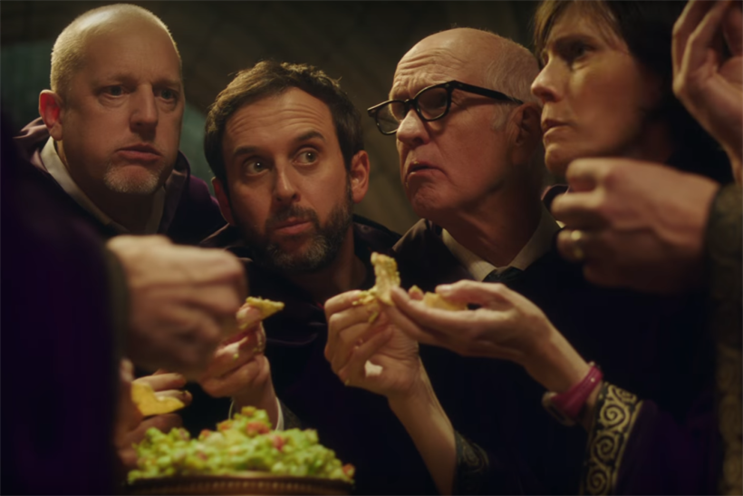 Avocados from Mexico returns to the Super Bowl for the third year in a row with another goofy and comedic spot. This time, a masked meeting devolves into a frustrating lecture on the fundamental purpose of secret societies. They’ve kept the moon landing hoax, Area 51 and the true cause of Deflategate under wraps, but they can't seem to keep the good news about avocados quiet. Turns out they’re healthy. New guidelines take into account the kinds of fat—avocados are heavy on mono- and polyunsaturated fats, as opposed to saturated fat (the kind in bacon). Avocados from Mexico capitalizes on the regulatory change in its 30-second Super Bowl spot from GSD&M, which will air during the first commercial break of the first quarter of the game. The brand released a 90-second cut of the spot this week, which followed a 30-second teaser featuring comedian Jon Lovitz as a subliminal hypnotist that broke last week. In 2015, the then-little known brand ran its first Super Bowl spot, which became a surprise hit. Former NFL star Doug Flutie and three-time Super Bowl champion Jerry Rice provided commentary for a Paleolithic "draft" of plants and animals. Mexico gets avocados, natch. Last year, the brand sent avocados into the future. The Super Bowl 50 spot featured an alien tour of Earth artifacts, including Scott Baio behind glass and guacamole. While some brands like 84 Lumber and Budweiser are tapping into the political zeitgeist with pro-immigration Super Bowl spots, Avocados from Mexico is staying the course and avoiding any controversy, despite its obvious interest in preventing a Trump-fueled trade war with our neighbor to the south. Nearly 80 percent of avocados eaten in the U.S. are imported from Mexico.